There's nothing quite like a traditional, family-oriented lake motel vacation, especially when it's in Cooperstown, N.Y.
As a child growing up in the 1960s and 70s, taking a family vacation to a Cooperstown motel located on a lake with a private beach was definitely on the "A" list of my childhood joys along with the local ice cream stand, playing baseball with friends at the park and having family barbecue chicken dinners on the charcoal grill in the backyard. What special memories, the type that you wish there was some way to return to in our more faster-paced modern world. Happily, the lakeside memories from yesteryear still exist today at places like the Bayside Inn and Marina in Cooperstown, an ideal, clean, updated, pleasant, reasonably-priced family-oriented motel that has all the earmarks of a classic motel lake vacation destination from the past. It's real testimony to the magic of the Bayside when you get goosebumps by just pulling your car into the parking lot. For starters, hanging flower baskets and colorful rockers outside the sunny-looking, white wooden house-like main lobby building sets a most welcoming tone. Inside, the classic carpeted, dimly-lit lobby with friendly desk help provides a warm greeting, while the adjoining family room with board games like Twister and a television with cartoons playing leads out to a fabulous, large wooden deck where one can see the timeless beauty of nine-mile long Otsego Lake. The deck features tables and chairs under umbrellas and offers wonderful scenes of an inviting BBQ pavilion, the updated, renovated 1950s-style motel complex, pleasant-looking family-style cottages (that can accommodate up to 10 people) and in the near distance -- beyond the majestic pine trees -- the small beach with its crystal clear waters. Here, kids throw away their carry-along technologies to get out to run, swim and play, while parents breathe in deeply the special Cooperstown mountain air to rid themselves of suburban and urban stresses. Early morning sun at the Bayside Inn and Marina beach. For added fun, the Bayside offers kayaks and canoes, free of charge. There’s also a gazebo at the beach, a perfect place to bring your own breakfast or just kick back and relax and revel in the lost art of doing nothing. Add a game room and fitness complex back at the main lobby building, and you really have an all-inclusive lodging destination. This is a different all-inclusive lodging destination, however -- it’s not forced to you through marketing hype and big advertising budgets. Rather, you generate the special memories on your own the minute you arrive to find your instant friends behind the desk and in the form of one of New York State’s most beautiful lakes. Kayaks at the Bayside Inn and Marina. Back in your cozy motel room with the laundry-fresh smell, there's a great mix of old-time and modern day amenities: cable TV, HBO, in-room phones, high-speed wireless Internet access, room-controlled heat, air conditioning, small refrigerators, coffee makers, hair dryers, iron and ironing boards, and private baths. 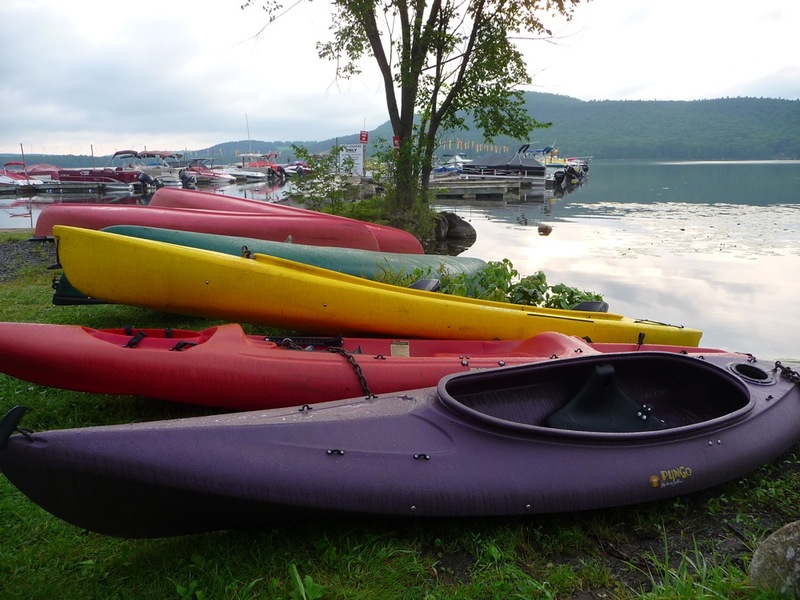 Nothing fancy, but truly a great foundation to enhance your stay by the lake and all that Cooperstown has to offer (we recommend you browse the entire site for vacation ideas in this special central Upstate New York region). The Bayside Inn and Marina is ultimately a lodging destination with character and personality and where pride of ownership and a one-of-a-kind location help create memories for a lifetime. In our modern world of society striving to find the best things in life -- often carrying a certain social status and hefty price tag -- it's nice to know that the family motel on the lake is still alive and well. These places might not make the "front cover" in our "I want it all now" world, but for those who have taken the time to slow down, connect with each other and enjoy the simple things in life, the lake motel vacation remains a most remarkable tradition. The Bayside Inn and Marina captures this very special essence, to the highest degree possible. 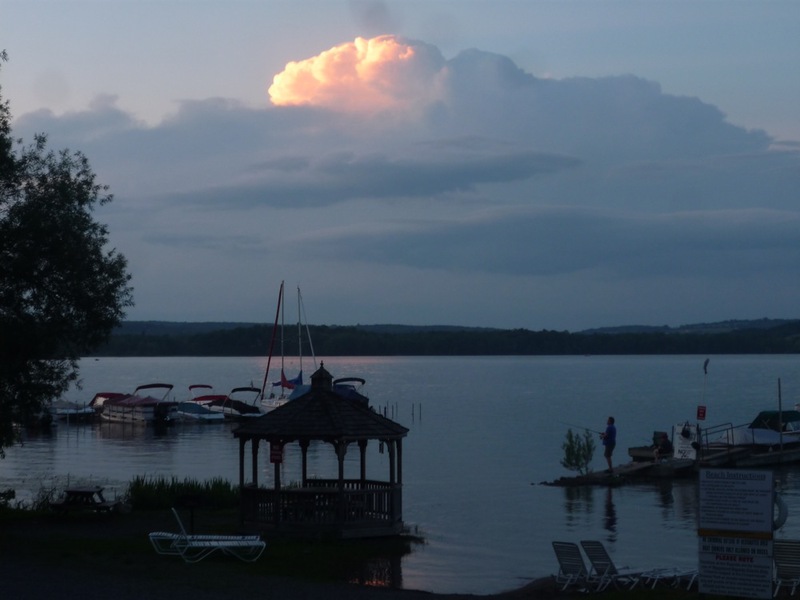 The Lake 'n Pines is also a worthy contender when it comes to lake motel vacations in the Cooperstown area with its gorgeous views of Otsego Lake. 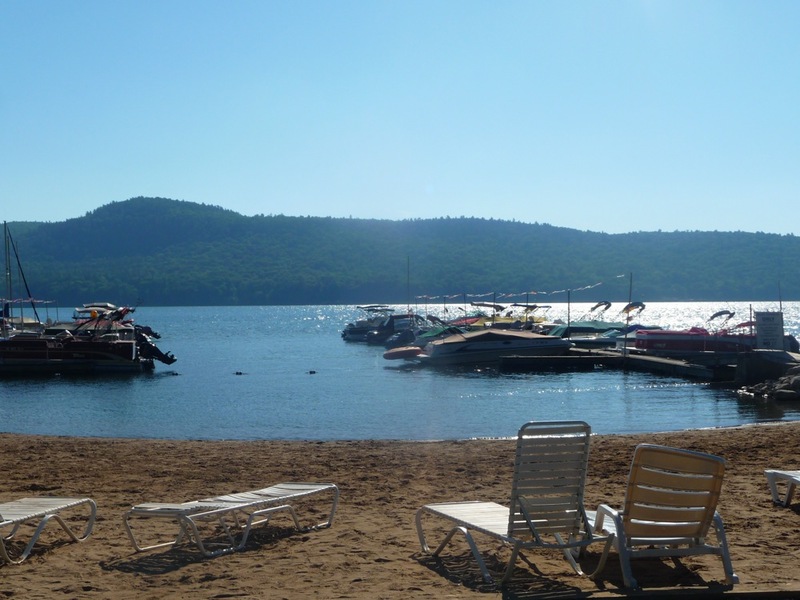 With well-kept motel rooms and cabins, a swimming area, boating and an indoor pool, the Lake 'n Pines is a great family lodging choice and less than 10 minutes to the Village of Cooperstown. The mix of tall pines, the glistening lake, nice rooms and a pleasant staff make the Lake 'n Pines the top lodging choice outside the Village. Great place, but I would go first with the Bayside Inn and Marina. 7102 St Hwy 80, Cooperstown, NY - (607) 547-2790. 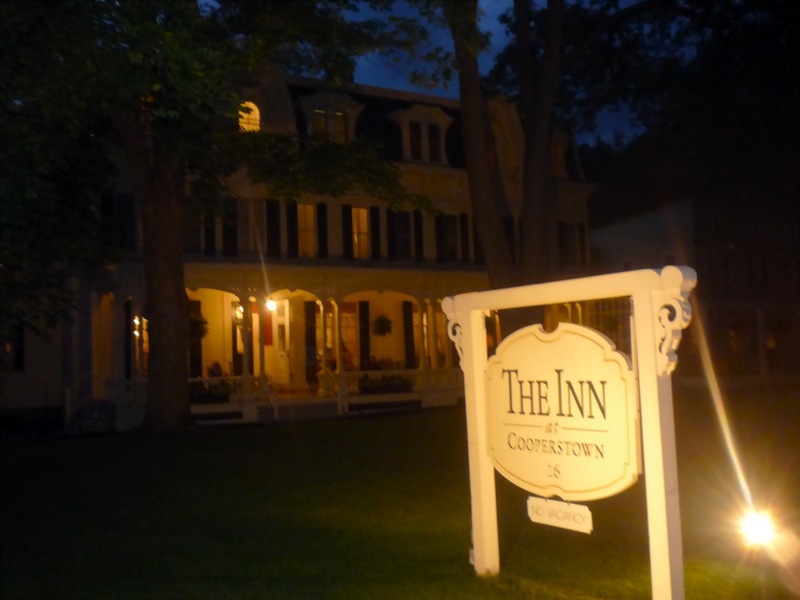 The Inn at Cooperstown is a tremendous lodging destination. The rooms, so classy but informal, make for a great night's sleep. The dining and living room area evoke a more elaborate version of the old-time feeling of your grandparent's house. Everywhere you look there is a nuance that sticks in your mind, long after returning home. The Victorian furnishings, antiques, a fireplace, the comfy couches, and old-fashioned chairs make one want to stay indoors all day long. 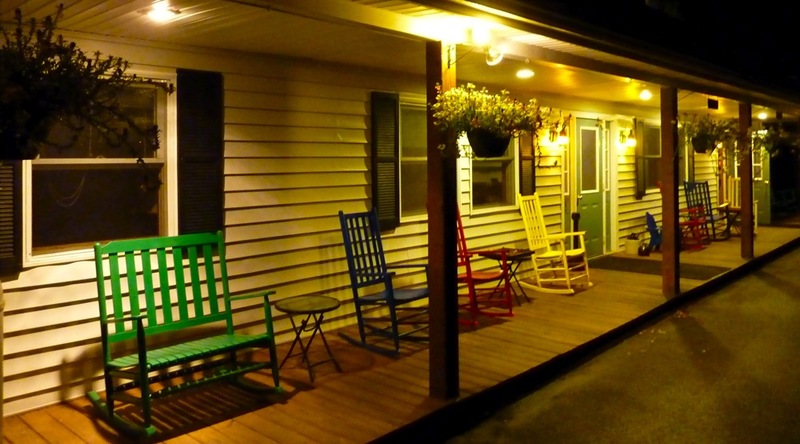 The long front porch, with its wonderful rocking chairs, gently puts everything in perspective by allowing you to unwind in the grand Cooperstown Village atmosphere. Perspective can be gained here as everyday life -- high-rises, rush hours, cell phones and other aspects of the ironic use of the word, "civilization" --seems secondary to the slower pace and grace of this Chestnut St. location. 16 Chestnut Street, Cooperstown, NY - (607) 547-5756. The Nelson Avenue Pines is close to Otsego Lake and all Cooperstown Main Street activities. A stunning 1870s Victorian set to Country French decor and antiques, the Nelson Avenue Pines is located on a street (Nelson Ave., of course) of magnificent large homes, close to Main St. The Nelson Avenue Pines is spotless on the inside with some very pleasant rooms, including a full third floor for families and others wanting more space. Owner Penny Gentile is a gracious host and one of the nicest people you will ever meet. She knows how to run a bed and breakfast, and more, importantly she truly loves the work she does -- that makes the stay delightful. The Nelson Avenue Pines is kid-friendly, and offers perhaps the best breakfast in Cooperstown, with incredible aromas of freshly roasted coffee, daily baked delicacies, and house specialties of crepes, Belgian waffles, or French toast a l'orange, as well as a great tropical fruit salad. 20 Nelson Avenue, Cooperstown, NY - (607)547-7118. The Landmark Inn is a great example of stately Victorian architecture, residing on a large (and pretty) Chesnut St. lot. Recently remodeled (it was great before that), the Landmark Inn, built in 1856, offers first-class accomodations set to high ceilings, exposed cherry and chestnut floors in the living room, dining room, and guest rooms, a grand staircase, internal and external flourishes with every step, a wonderful backyard perfect for outdoor receptions, and a short walk to the downtown. We have not been to the Landmark under its new ownership, but look forward to doing so. Past owners Linda and Bob Schuermann ran the Inn beautifully with warmth, grace and professionalism. Word is newest ownership has kept that magic combination and an eye for restoration, which is good news for those looking at staying at, pardon the pun, a true "landmark" in Cooperstown. 64 Chestnut Street, Cooperstown, NY- (607)547-7225. The Barnwell Inn is a true hidden gem at 48 Susquehanna Ave. in the Village (Tel. 607-547-1850). Tara and Mark Barnwell own this elegant yet informal and friendly 1850 Victorian home with furnishings and antiques that match the era. With freshly brewed coffee in the morning, sherry in the afternoon, an apple tree to sit under and some very charming first and second-floor rooms, the Barnwell Inn feels like a relaxing getaway, yet it's just a few minute's walk to the heart of Cooperstown Village. What's more, the breakfast in the beautiful, old-world dining room is memorable with fresh fruit, quiches, meats, breads and juices that help start your special day off on the right foot. Tara and Mark are really special and unassuming people, the ultimate bed and breakfast hosts who just might remind you of your favorite relatives! Those preferring a chain hotel near Cooperstown Dreams Park on Route 28 and yet close to the village would do well with Best Western Cooperstown.